Scott Townsend’s projects have taken place recently in Florence Italy, Belgrade Serbia, and in several locations in Greece. 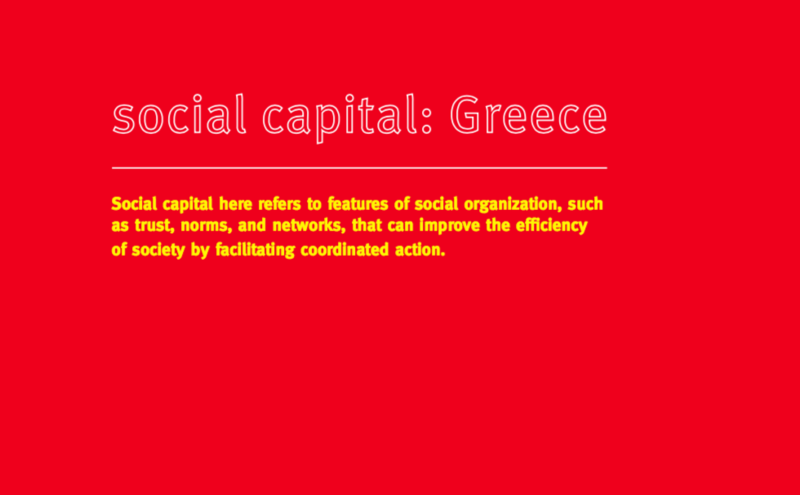 Social Capital: Greece is an exhibition developed from research in the community of Kefalonia in western Greece. Southern Europe has a history of migration, regional conflict, and economic austerity. While communities suffer hardship, they also are resilient, finding ways to solve ongoing social and economic issues. The work in this exhibition is both exploratory, based on interviews and interactions in the community (lower gallery), and responsive (upper gallery), where local, regional and international interests intersect in Kefalonia in designing solutions based on the knowledge and resources found in the community on an ongoing basis. “I’m interested in borders and how people manage their communities and identity. This is on a scale from the individual to local to global borders. For two years I’ve been working in communities in Italy, Serbia, Greece, and Cairo, Egypt. I use interactive maps and other designed things in order to understand and develop long-term connections and dialogue in the community. This exhibition is about the communities of western Greece and creating ongoing dialogue about local issues and history, living and working abroad, as well as Greece’s connections to the EU. Instead of digital interactive maps, I developed portable kits based on the original interviews. The references can be sorted into simple categories in each box. The discussions and sorting occur in the spaces where people live and work. These arrangements can be photographed, displayed, and compared. Sorting also helps people talk about things and discuss what they think. I created projected animations that express a number of ideas and themes from the research in discussion with community members.